It’s not that they don’t know. I’m sure they do know by now. They have to, but for the sake of the narrative, they need to peddle straight garbage about firearms to get their base drummed up. At the same time, the Left could very well be that brain dead about firearms. The anti-gun Left doesn’t care about facts; they want to destroy our constitutional rights to individual gun ownership. For some, this plan is quite clear. To others, well, it’s just misdirected advocacy. Democrats care about saving lives, guys! Except that they don’t. If they did, they wouldn’t keep pushing so-called gun control policies that would do next to nothing to curb gun violence or prevent mass shootings. On top of that, they’re peddling straight fiction about the National Rifle Association, the Left’s favorite boogieman. 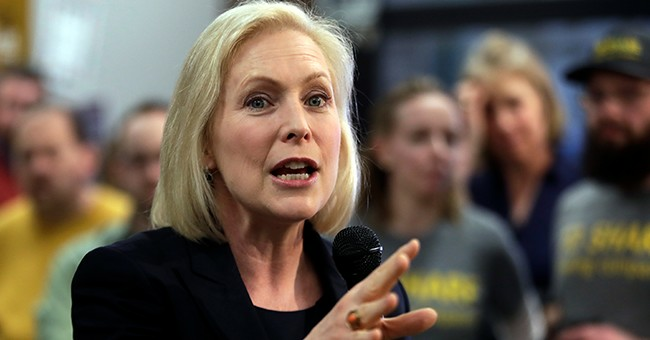 Whether it’s complete ignorance or bad staff work, Sen. Kirsten Gillibrand (D-NY), a 2020 candidate, sure is working hard to capture the far left but also making sure everyone else knows that she’s just another brainless liberal who knows next to nothing about firearms. Well, first of all, gun manufacturers don’t sell automatic rifles. They can’t. New sales were banned after 1986. Walmart already has to conduct background checks on all gun sales. And we all know that a push for universal background checks is nothing more than opening Pandora’s box to a gun registry. And do we really have to explain how constitutionally shady the terror watch list is, where there is no due process and where one can be denied his or her Second Amendment rights for merely being accused? That’s not how our system works. It’s just another day that ends in “y” when it comes to Democrats and firearms. And yes, knowing the terminology and the regulations matter, though Alexandria Ocasio-Cortez might disagree. Remember, we’re in the ‘we can lie as long as we’re morally right’ era of left-wing politics. Facts matter (what network has made this their anti-Trump war cry?) You need to know the law as president. It’s part of the job description.